There is no denying that Budapest is an epic tourist destination and ticks all the right boxes for both solo and group travelers. But one thing that not everyone knows about the Hungarian capital, is that it has a uniquely alternative, underground nightlife scene that comes in the perfectly shaped form of the infamous ‘Ruin Bar’. What is a Ruin Bar we hear you cry! Well, take one abandoned, derelict and often dilapidated building and insert a pile of quirky, vintage, second hand or repurposed furniture and a fully-stocked bar. Now complete this with hipster bar staff and plenty of cool young locals. Now you’ve got a basic picture of the now-iconic Budapest Ruin Bar! The city is full of these popular and peculiar local haunts, but to help you navigate the city, here are Eventhuse’s top eight Ruin Bars to Visit and include on your travels to Budapest. Located in the hip District VII, this local hotspot has reached landmark status since it first opened in 2004. 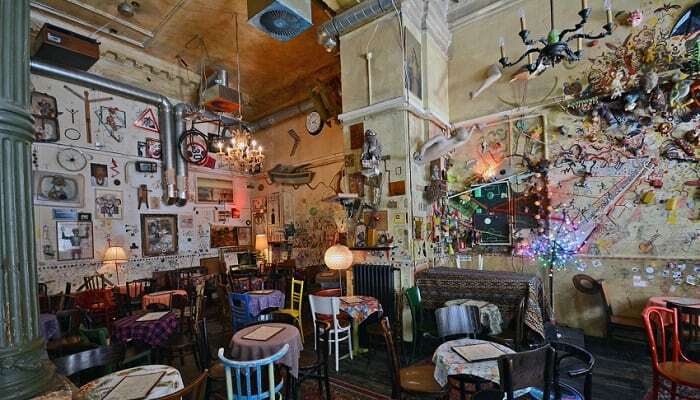 Often counted amongst the original pioneers of the Ruin Bar concept in Budapest, Szimpla Kert is also one of the most authentic of the genre, however its popularity has made it well-known amongst international tourists. Live musicians often play here, craft beers are produced on site and a farmer’s market is hosted every Sunday. With seven dance floors and 15 bars all in one place, Fogas Ház is one of the top spots in town for a real party. It’s a huge complex and each of the different areas has a different vibe. You can go for a more chilled-out atmosphere on the roof terrace, or a more hard-core rave feeling in the wall-vibrating LÄRM nightclub. Every night is different at Fogas Ház. As it is affectionately known by the local regulars who frequent it – is more of a chilled-out Ruin Bar for an early afternoon drink break rather than wild night out. As the name suggests the bar is a vintage treasure trove with random antiques, furniture, knick-knacks and decorations lining the walls, floors and ceilings. An added bonus is its location just on the corner of a lovely green Csendes Társ park. Once an auto repair shop, Kuplung is now at the heart of the Ruin Bar party scene. It provides an underground vibe that keeps the locals and tourists coming back for more. The walls of the bar’s narrow outdoor courtyard at the back are adorned with large-scale mural street art, giving the hub a gritty urban feel. Also, the bar’s location right in the party district make it a great option for tourists. This surreal labyrinth of fantasy is well known around Europe as one of the best nightclubs. It also prides itself as the biggest Ruin Bar in Budapest. The Ruin Bar is made up of a rabbit’s warren of 26 different rooms. Each of which is decorated and themed differently and plays different music. It’s like a magical, forest, fairy-tale land which you are guaranteed to get lost in. Who knows what you might find along the way! This one is a bit more upmarket on the grand scale of Ruin Bars in Budapest. But it does makes for a pretty stylish spot to drink, with a huge glass roof and a white-pebbled floor. The popular hangout is also an art center and connected to the area’s Jewish history through the food served. And it’s actually pretty darn good food too, with delicious falafel, hummus and parget chicken skewers. This secret spot hides in plain sight, behind a plastic curtain inside a formed meat factory in the center of the buzzing Jewish Quarter. Just off Kazinczy Street, the hip in-the-know locals hang out here at the lively and atmospheric open-air courtyard. They take in live music, art events and movie screenings. Even more so they just enjoy the excellent beer and surprisingly good Mexican food. This is where the cities trendy crowd come out to play. Where some of the other Ruin Bars are more vintage treasure trove style, this hip out-post is more pared back, minimal and industrial. 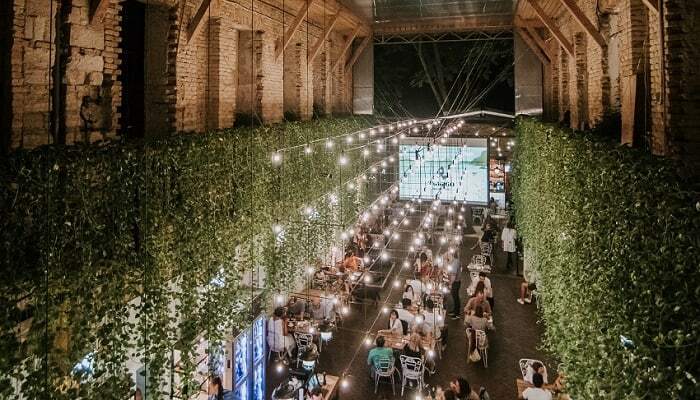 Located in an abandoned factory it’s basically one big beer garden made up of connecting courtyards. Music events, exhibitions, movie screenings and flea markets all take place here. So, now that you’ve got your Ruin Bar pub crawl sorted, why not seize the day and check out some of our exclusive Budapest activities and feel free to get in touch for advice or a quote.